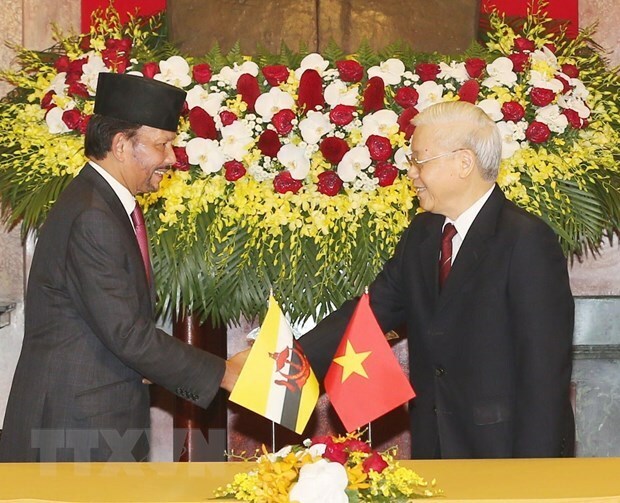 Hanoi (VNA) – Sultan of Brunei Haji Hassanal Bolkiah on March 28 concluded his three-day state-level visit to Vietnam, which was made at the invitation of Party General Secretary and President Nguyen Phu Trong. The visit marked a new milestone in the traditional friendship and partnership between the two countries. During the visit, the two sides issued a joint statement on the establishment of the Vietnam-Brunei comprehensive partnership. After a welcome ceremony at the President Palace, the Brunei leader had talks with his host Nguyen Phu Trong, and met with Prime Minister Nguyen Xuan Phuc. On the occasion, he paid tribute to President Ho Chi Minh at the late leader’s mausoleum, and laid wreath at the Monument of Heroic Martyrs in Hanoi. At the meetings, the two sides agreed to make two-way trade balance and sustainable, targeting 500 million USD in 2020. They will optimise advantages in market access for each other’s goods and services on the foundation of free trade agreements, including markets in the East ASEAN Growth Area (BIMP-EAGA), while creating favourable conditions for businesses and promoting connectivity between business communities of both sides. They will join trade fairs and deal with obstacles facing enterprises. The two countries concurred to enhance cooperation among education facilities through the exchange of students and lecturers, as well as joint research and training programmes. They will soon organise the second meeting of the joint working group on education cooperation. Both sides will continue creating favourable conditions for the issuance of work permits for Vietnamese labourers in Brunei and vice versa, while considering the expansion of visa exemption for popular passports holders from 14 to 30 days, and to 90 days for those holding diplomatic and official passports. Vietnam and Brunei also shared standpoints on regional and international matters of mutual concern. They agreed to continue working closely in dealing with global and regional challenges such as trans-national crimes, climate change response, natural disaster control, sustainable growth promotion and food-water-power security. The two sides reaffirmed the significance of maintaining and promoting peace, maritime and overflight security, safety and freedom in the East Sea, and stressed the need to strengthen mutual trust and settle disputes peacefully in line with international law, including the UN Convention on the Law of the Sea. All the claimants and the other countries need to demilitarise and exercise self-restraint when conducting activities which could increase tensions in the East Sea, they stressed again. The two sides emphasised that they support the full and effective implementation of the Declaration on the Conduct of Parties in the East Sea (DOC), while welcoming advancements in ASEAN-China cooperation as well as in practical negotiations to finalise a code of conduct (COC) in the East Sea following the agreed roadmap.